Kentucky guard Tyler Ulis celebrates during the Wildcats’ win against Auburn at Rupp Arena on Feb. 21 in Lexington, Kentucky. Almost since college basketball’s tipoff last fall, one question has dominated the season: Will Kentucky finish undefeated? Now the Wildcats are more than two-thirds of the way there. Kentucky heads into its game Wednesday night at Mississippi State at 27-0, needing just 13 more wins to match the last undefeated men’s team — the 1976 Indiana Hoosiers. The question is more relevant than ever. But the answer remains: probably not. 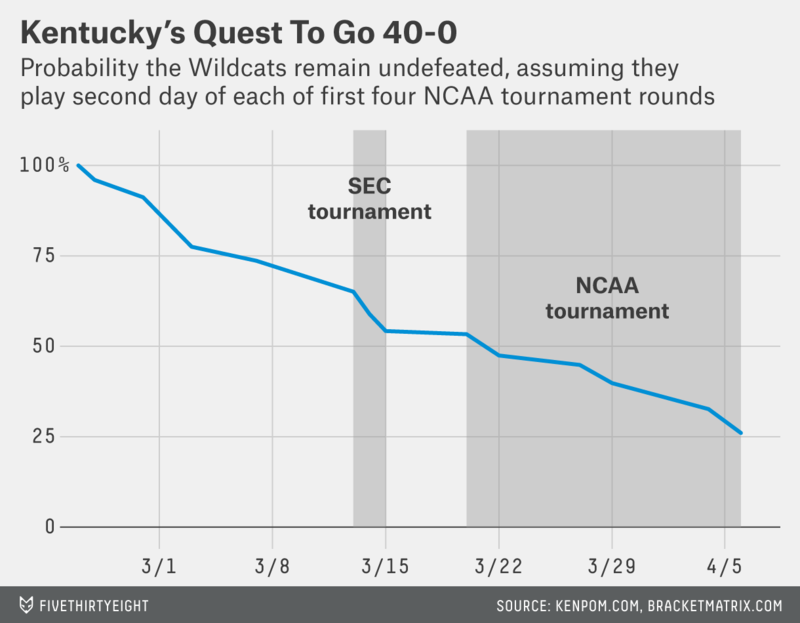 But wait — that can’t be right: Plenty of people have said all along that Kentucky would probably go undefeated. One professional sportswriter said Kentucky would do it — back when the Wildcats were a formidable 3-0. That was before Kentucky had faced four of the “5 teams that will keep Kentucky from going undefeated” — five teams it eventually beat by an average of 21 points. Bill Self — the coach of Kansas, the first of those five teams — said after his Jayhawks’ 32-point loss in November that “if by February they’re still undefeated,” a perfect Kentucky season “could happen.” All those people can’t be wrong, can they? Just because the Wildcats probably would be favored in each of the 13 games they’d have to win to go undefeated — and as long as they keep winning, they will be — doesn’t mean they’re favored to go undefeated. For a coin to likely come up heads 13 times in a row, it needs to be loaded pretty heavily. And at least some of those games should be close. Before the end of the regular season, Kentucky faces Florida and Georgia, two teams that gave it tough games earlier this month, plus No. 18 Arkansas. Kentucky could face any of those teams in the SEC tournament, or maybe other conference rivals Ole Miss, Texas A&M and LSU, three teams that Kentucky outscored by a combined two points in regulation. (It won two of those games in overtime.) If it emerges from all those challenges unscathed, Kentucky would have to beat six opponents in March Madness, including up to four among the top 20 in the country. Our ESPN colleague Alok Pattani ran the numbers earlier this month, right after LSU almost ended the Wildcats’ undefeated run. He came up with a 24 percent chance that Kentucky would go 40-0. We’ve updated his calculation, with a couple of changes. We used ratings from Ken Pomeroy instead of ESPN’s Basketball Power Index to run 10,000 simulations of the rest of Kentucky’s regular season, the SEC tournament and the NCAA tournament. And instead of using just our ESPN colleague Joe Lunardi’s bracket prediction, we used the consensus bracket according to Bracket Matrix. Considering these changes and that the Wildcats have played three games since then, the results are remarkably consistent. We give Kentucky a 74 percent chance of winning all four of its remaining regular-season games, a 73 percent chance of winning the SEC tournament and a 48 percent chance of winning the NCAA title. That’s very high for a 68-team, single-elimination tournament; no team had above a 15 percent chance of winning last year’s tournament when it began, according to FiveThirtyEight’s model, which is more sophisticated than the one we’re using here. Put this all together, and we give Kentucky a 26 percent chance of going 40-0 — which is consistent with Pattani’s calculation of 24 percent, three easy games ago. These calculations are a rough estimate. They don’t account for the likelihood that Kentucky’s ratings will keep getting better if it keeps winning (although the Wildcats could fall in the ratings if they don’t win by as much as expected). And they don’t account for motivation — either to make history and go undefeated, or to take it easy in some games before the NCAA tournament, or to play without their best players so coach John Calipari can teach his team a lesson. But the two different methods agree: It’s safe to say that Kentucky has about a 1 in 4 chance to finish undefeated. Which is pretty high for an accomplishment that would be the first of its kind in 39 years.